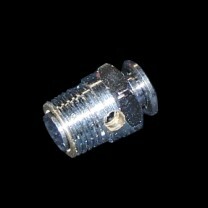 This is a low profile mini push button pneumatic valve. Commonly used on a modified sprinkler valve(see the sprinkler valve product for a picture of this valve installed). It has male 1/8 inch threads on the intake(bottom) and dual exhaust ports(non threaded). This valve has been modified to increase the air flow to make the sprinkler valve open quicker.